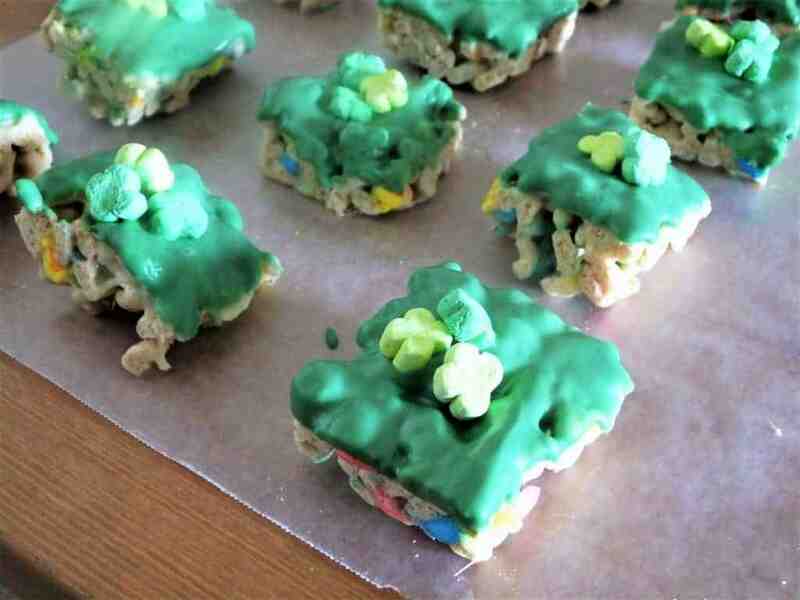 If you are looking for a fun and simple St. Patrick’s Day dessert recipe, you’re going to love these St. Patrick’s Day Lucky Charm Bars. Happy Friday! We have just 14 days until St. Patrick’s Day so I thought it was about time for a little seasonal treat to get you in the leprechaun spirit! 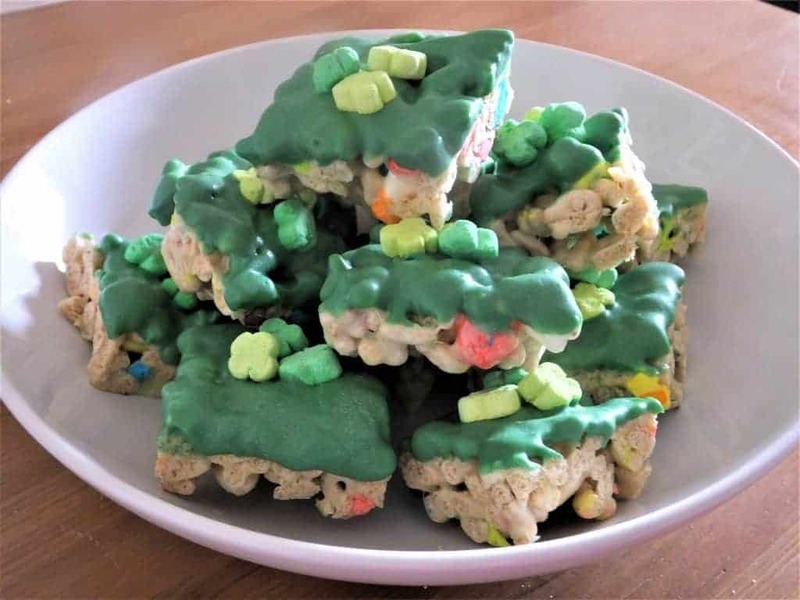 I asked my girl Clarissa back to share something for St. Patrick’s Day and I love the St. Patrick’s Day Lucky Charm Bars that she came up with. I know you typically don’t see any cooking or recipes on the blog and that’s mostly because I’m a train wreck when I’m in the kitchen – not to say that I can’t whip up a yummy dinner…but I can’t keep the counters clean enough to take any pretty pictures (or much less think of anything else when I’m cooking). Haha! Maybe someday I’ll be able to get it together enough to bring you some good recipes ideas. Until then I’ll let my friends, like Clarissa, do the honors… Take it away girl! Hey everyone! Clarissa here from The View From Here, excited to be back guest posting at Making Manzanita! 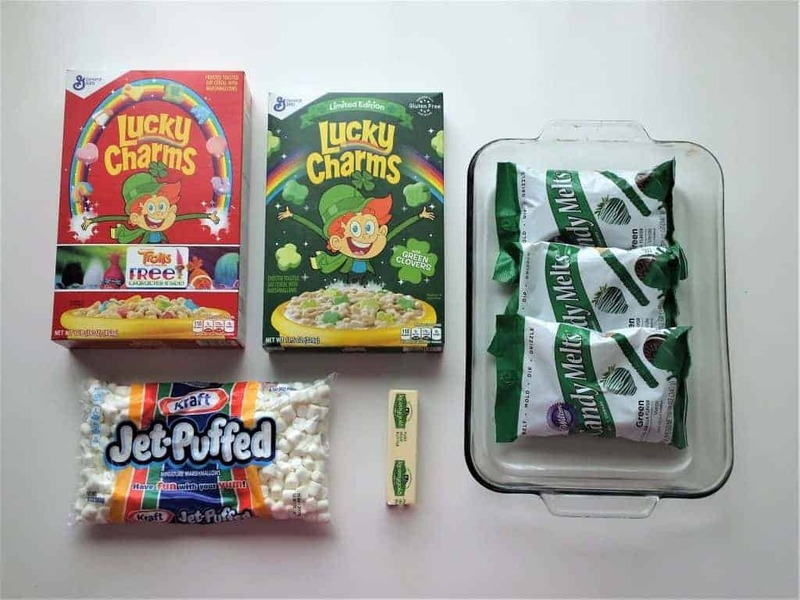 Today we’re going to make some awesome St. Patrick’s Day treats, with none other than the most perfect St. Patrick’s Day cereal: Lucky Charms. Hearts, stars and horse-shoes, clovers and blue moons! Pots o’ Gold and Rainbows, and the red balloons! You sang it, admit it. In our younger, college years, St. Patrick’s Day was almost exclusively reserved for wearing green, claiming to be Irish, and downing as many Baileys-filled Guinness beers (not-so-affectionately named an Irish Car Bomb) as you could, before stumbling back to your dorm room. 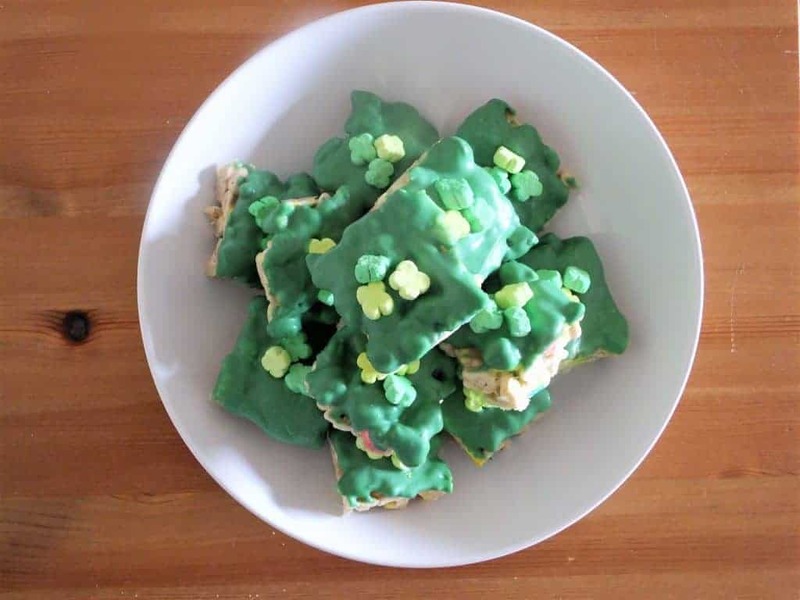 Now in my ripe old age of 27, the fiancé and I will be celebrating with a classic corned beef and cabbage dinner, followed by these not-so-diet-friendly St. Patrick’s Day Lucky Charms Bars for dessert (that’s right…cheating on my newly found Paleo diet…that’s how I get wild for St. Patty’s Day! #noshame). These bars are crazy easy to make! You only need a few ingredients and they honestly only take about an hour from start to finish. 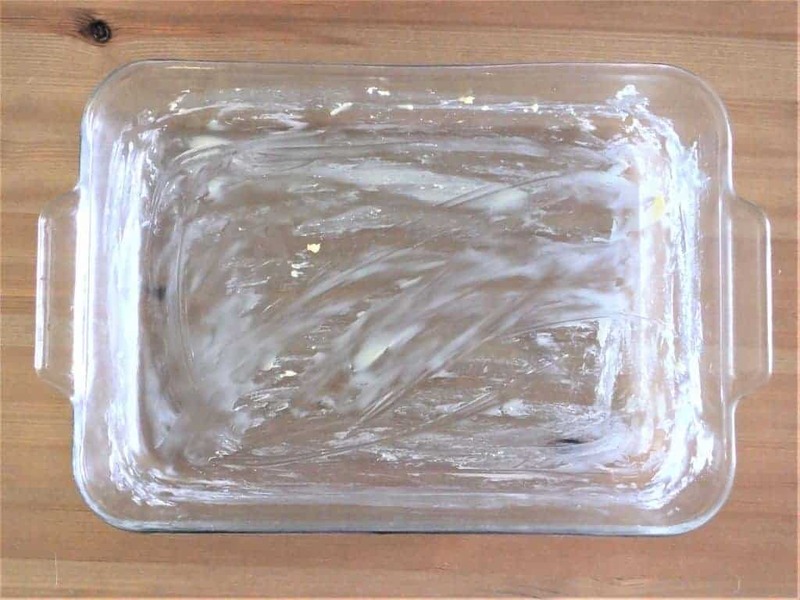 First, grease your baking dish with your butter. I used a glass baking dish that was WAY too big (I couldn’t find my square dish!) so keep in mind that this recipe will make about enough St. Patrick’s Day Lucky Charm Bars to fill a 9×9 pan, not this giant rectangular monster of a baking dish. 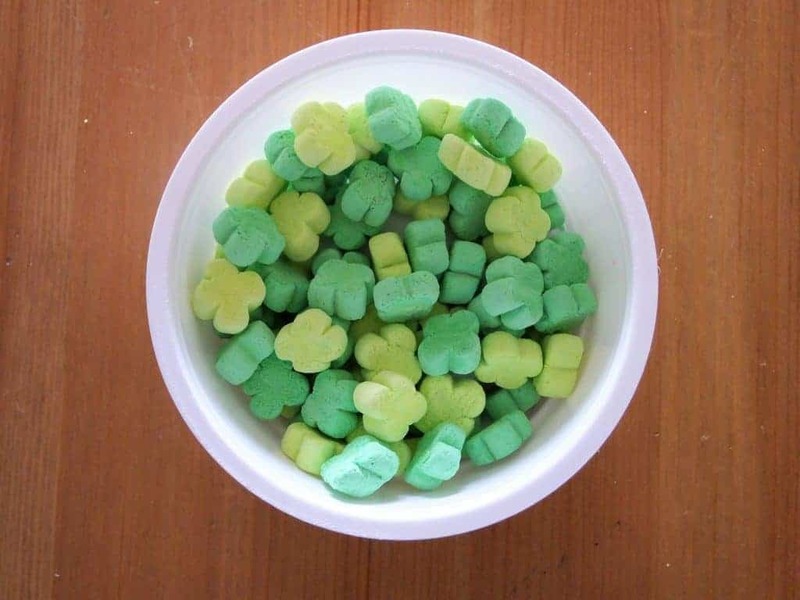 Next, pull out whatever marshmallow design(s) you want to end up topping your bars with – I chose the clovers from the Special Edition box. 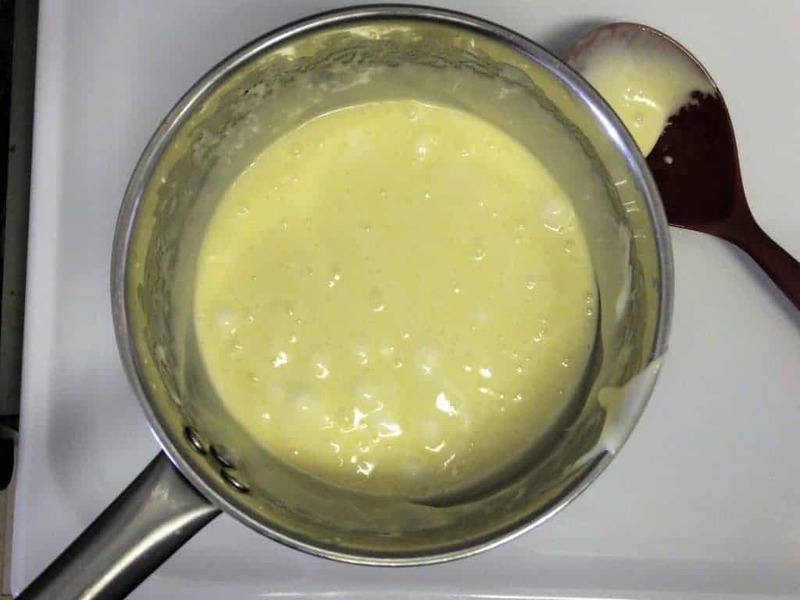 Heat a pot over medium-heat, add your 5 tablespoons of butter AND about 3 cups of mini-marshmallows and stir consistently until the mixture is smooth. This only takes a few minutes but be patient and keep stirring – do not raise the heat! It’ll burn your mixture and be totally gross. 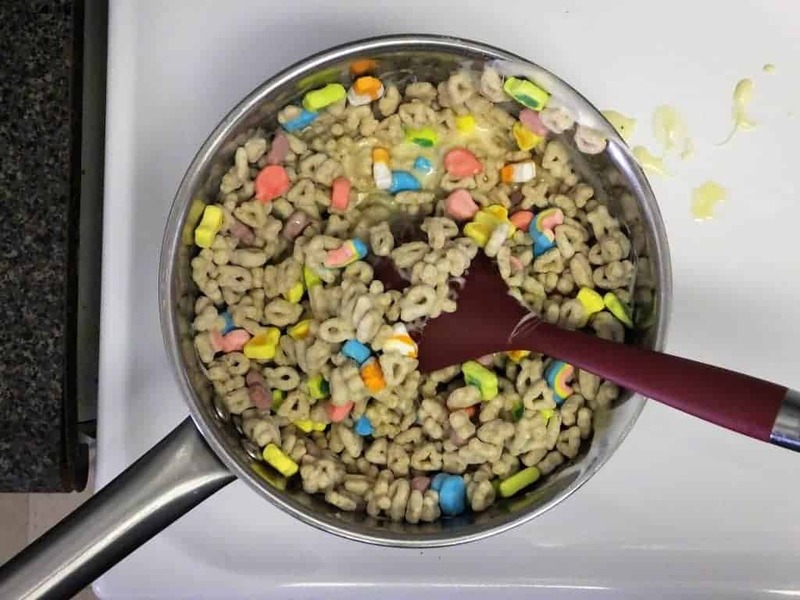 Add in 5 cups of your Lucky Charms cereal and stir frantically to coat all the cereal in your butter-marshmallow mixture. Once everything is mixed, spoon all your cereal bar mixture into your greased dish. Use a rubber spatula to push the mixture into the dish. It actually helps to give it a few minutes to cool once you’ve spooned it in, before pushing it down; the mixture is super sticky and will stick to your fingers/spatula when it’s hot. Let your bars set for about 30 minutes on the counter (no need to refrigerate). Once cooled, cut your bars into squares and lay on wax paper. Some of my bars had globs of my marshmallow mixture at the bottom (I didn’t stir quite well enough! ), so if that happens to your batch, no worries! 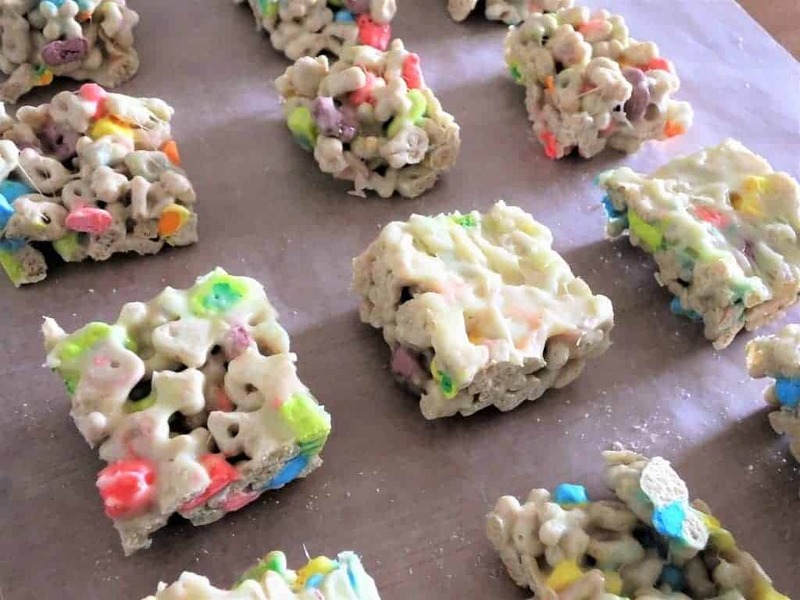 Just let those squares dry upside down like in the picture below, to expose the marshmallow mixture globs to the air and help them dry further. Melt your chips in the microwave, in 30 second intervals, stirring in between until completely smooth (read more here about melting Wilton’s Candy Melts, and adding flavor extracts if you want!) Then, take your cut squares and dip one side in your candy melts. Set the bars upside-down on your wax paper, letting the candy melt dry and set, facing upward. Before it sets, add in your marshmallow décor that you pulled at the beginning. And that’s it! Once your candy melt topping has set, your St. Patrick’s Day Lucky Charm Bars are ready to eat. Thanks for having me, and Happy (almost) St. Patrick’s Day! I’m Clarissa! The author & creative genius (ha) behind The View From Here – a blog devoted to DIY, food, and adventure. Check out the blog for weekly projects, recipes, travel guides and more as I document the facets of my creative journey! 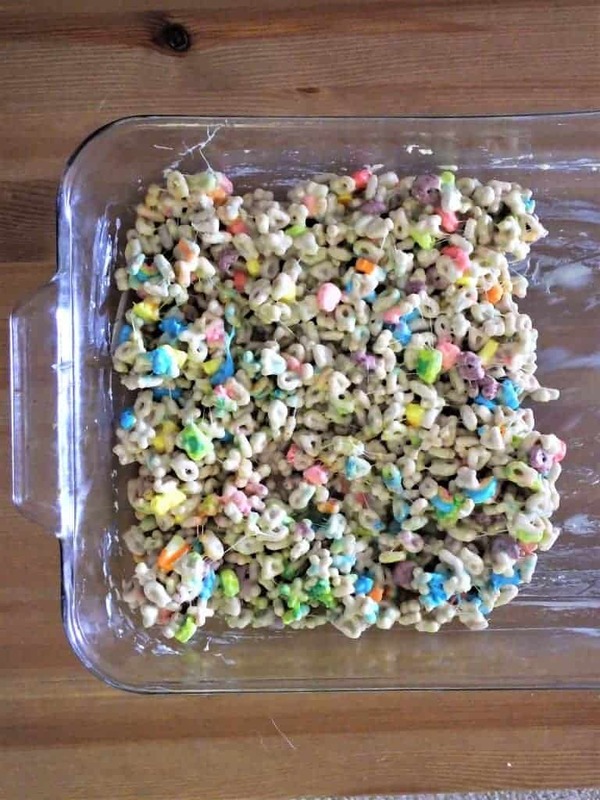 I can’t WAIT to give those Lucky Charms Bars a try! They look super yummy, right?! 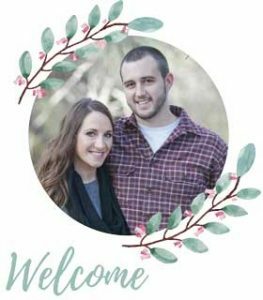 Be sure to hop on over to Clarissa’s blog, The View from Here. 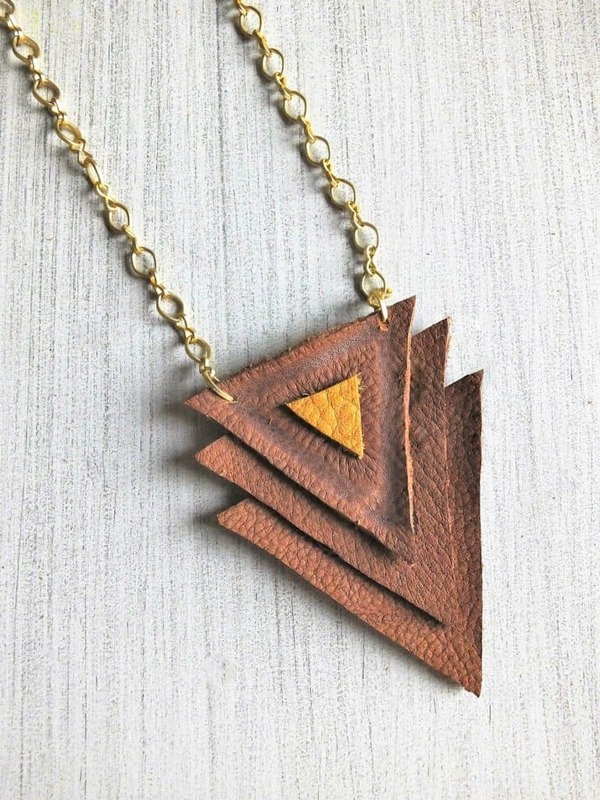 Here are some of her other awesome DIYs ! I’ve been following Clarissa on her fabulous blog and am glad to find yours. I loved the nod back to our college life in this post and am looking forward to making these Lucky Bars! Thanks Heidi! Any follower of Clarissa is a friend of mine 🙂 I can’t wait to give these bars a try too! They look so yummy. Clever! Growing up my mom mixed cereal, butter, and marshmallow together to make easy no-bake snacks, but she never dipped them in candy melts. Nice twist to an old favorite. I love the additional of the candy melts too! It’s the perfect touch of color to make the treats extra cute. This recipe is so easy and looks super delicious!!! I cannot wait to try it out!!! Thanks for posting!!! Thanks Tessa. Clarissa did an awesome job on this recipe. Looks super yummy! 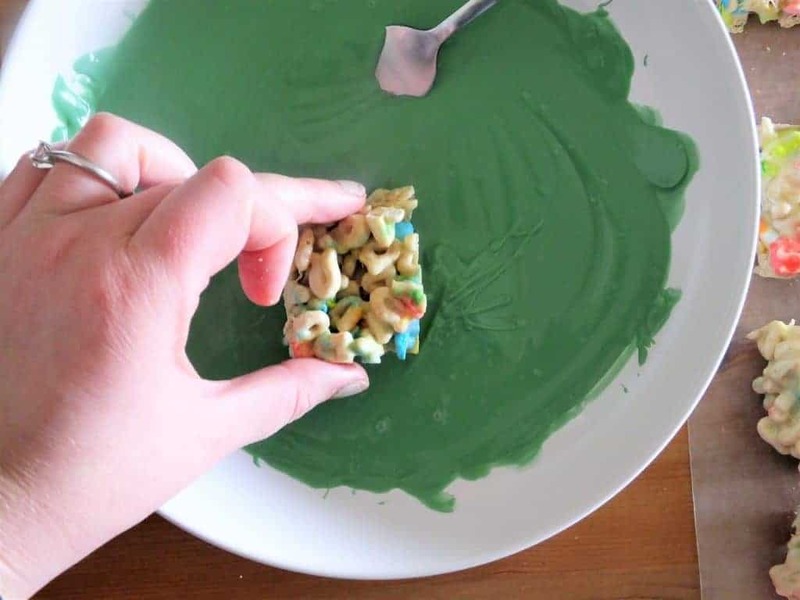 I used to eat Lucky Charms when I was a kid! Me too! … Truth be told, I STILL love getting them every once in a while when I have a sweet tooth. Thanks Kimberly! I can’t wait to give them and try. Clarissa did a great job on this fun recipe! Thanks Mallory! Have so much fun at your party. 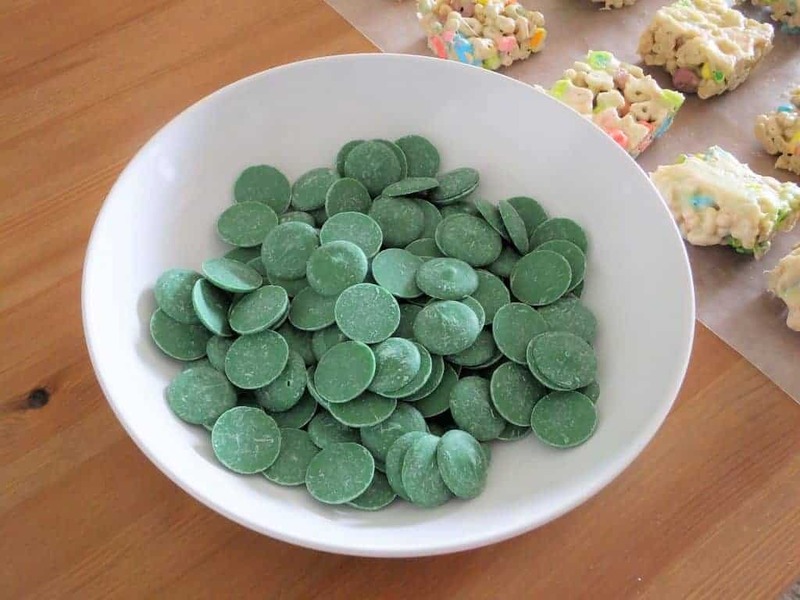 These are perfect for st. patty day!! Thanks Kelly! I love them too! Clarissa did a great job! These look so cute. And Lucky Charms has the best marshmallows. I know, I don’t know what they put in those little marshmallows, but they are so addicting! These St. Patty’s Day Lucky Charm bars look so colorful and delicious. Thanks for sharing!! Hi Aarika, thanks so much for your comment! Hope you have a great St. Patty’d Day next week. These are so clever! My boys will love them. St. Patrick’s Day is such a fun holiday, and these bars will really add a nice touch to our celebration! Thanks Anne! Have a great St. Patty’s Day!